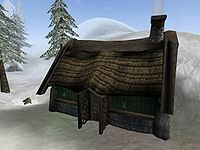 Uncle Sweetshare's Workshop is a home located south of Lake Fjalding and east of the Iggnir River, in the Isinfier Plains. This house is home to Uncle Sweetshare, a drug addict with a penchant for slipping 'unhappy' victims a little 'joy' (moon sugar). The body of his Khajiit assistant M'nashi lies directly outside the house, with some moon sugar and a copy of The Song of Uncle Sweetshare, an Alchemy skill book. If you ask Uncle Sweetshare about M'nashi, he admits to having been involved in his death.